I hope you’re all getting your fill of picnicking, swimming, grilling and fireworks! We are headed out for a fireworks-watching party later this evening, as long as the wildfire smoke behaves itself tonight. My quinoa tabbouleh is made and resting in the refrigerator and the hard cider is waiting patiently by the door, ready to travel. 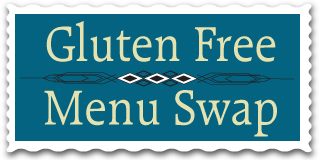 This week’s Gluten Free Menu Swap is hosted by Gluten Free Goodness and the theme is “Culinary Freedom”! This week I am taking the freedom to recycle a good portion of last week’s plan since we didn’t get to it! Below you’ll also see quite a few lettuce and kale salads. They are still both producing well in our garden since I have partially covered them with shade cloth. So we need to eat up! Leftover Pizza! and salad – from last week’s menu, a recipe from Pete over at No Gluten, No Problem. Tofu Stir Fry with rice – plus I will add some frozen lotus root that has been hiding in the back of the freezer. Sausages with Napa Cabbage Salad – veggie sausage for the hubby and spicy Italian for me! Sausages with Jambalaya Rice and Salad – we’ll eat up the remaining sausages. Hope you have had a pleasant holiday weekend – and here’s to a short work week! Woo-hoo! I often have to recycle meals! Your dal and kale sounds fantastic. Enjoy your 4th! Shade cloth in the garden … I don’t think I’ve ever heard of that. Makes so much sense. Recycling menu plans makes perfect sense! Enjoy tonight! We live at 5500′ so the sun is very intense here. Many plants don’t like the intensity and it makes some things bolt quickly and early. Plus the cooler season veggies prefer the shade in the summer too (ie, lettuce, kale, spinach, cabbage, cilantro, parsley, etc.). So I have found adding shade cloth helps them continue producing. I also plant some of these items on the north side of the house to try and keep them going all summer long. I am even trying some tomatoes on the north side of the house this year, out of curiosity and they seem to be doing quite well. So often my tomatoes out in the regular garden plots really struggle with the heat and drying winds and it causes blossom end rot. Urgh. Gardening here is a battle! We can buy shade cloth here at HD or Lowe’s. We have pvc pipe curved in hoops over our beds and we use the giant office binder clips to clip the shade cloth (or bird netting) to the pvc pipes. It is a nice gardening tool here. Is the veggie sausage you use gluten free? I haven’t been able to find any gf meat alternatives. Good question! My husband is the full lacto-ovo vegetarian. I am mostly vegetarian, more of a flexitarian! I have problems getting enough B-12 so I do eat meat periodically. But I generally cook gf and veg. There is more info on my About page if you’re interested. I used the soy chorizo in a recipe last summer: https://beyondriceandtofu.com/2010/10/31/chickpeas-with-sausage-and-sun-dried-tomatoes/ It was pretty good! Also, there are some veggie patties out there that are gluten free. Have you found those yet? Check out Amy’s – one variety is, the Bistro Burger, but they supposedly have another one coming out soon. Sunshine burgers are also gluten free. I think there is another brand but I can’t think of it right now. I like the Amy’s Bistro Burgers, myself. Thanks for the burger tip! I tried making homemade ones this weekend but they fall apart!